1 of 2 Heat oven to 375 degree F. Rub turkey on all sides with lemon juice and olive oil. Rub lemon pepper and Italian seasoning over turkey. 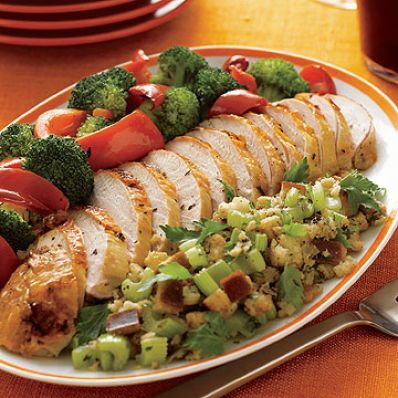 2 of 2 Place in a roasting pan, breast-side up, and roast in oven for 2 to 2-1/4 hours or until internal temperature reaches 165 degree F on an instant-read thermometer. Let rest for 15 minutes before slicing. 1 of 2 Pour off all but 3 tablespoons of drippings. Whisk together the flour and chicken broth. Stir into roasting pan and scrape up any browned bits. Simmer for 2 to 3 minutes. Strain and keep warm. If too thick, add a few tablespoons of water. 2 of 2 Slice turkey; serve with gravy, vegetables and stuffing, if desired. Per Serving: 668 mg sodium, 4 g carb., 5 g Fat, total, 212 mg chol., 1 g sat. fat, 391 kcal cal., 0 g fiber, 77 g pro.